At Conifer Property Services we, as do most damp proofing contractors, still get involved in the old 'damp inject and render' solution for many of our jobs. Sometimes this is due to costs or site conditions, the length of time the treatment needs to last or myriad other constraints. Many damp companies only do this kind of work because it's probably the cheapest method and it's the price that gets them the business! Fair enough! It really is 'horses for courses' though. In many situations we are now recommending membrane solutions because, if they are installed correctly, they are pretty much bullet proof! Also they work well with cavity drain and sumps for extreme or underground cases. As part of the process when implementing rising damp solutions, we also use a water proofing agent in the render, usually Renderguard Gold. When used in the correct measure this product really does increase the waterproofness of render and it also holds back the salts in the wall. You may ask, "why does that matter?". The fact is that salts can attack your plasterwork and paints, etc. if left untreated. By adding the appropriate admixture you can prevent this and add to the effectiveness of your render as a damp proofing system. Don't forget that any existing render needs to come off the wall first or the system will not work to its potential. Now I won't lie to you, removing the old render can be a real pig of a job but it is essential. The render must be removed to the height of at least 1m (which is usually but not always the extreme range of rising damp - high external ground levels or old membranes can dramatically affect this, seek advice if you are unsure). If you have penetrating damp, that is damp that is coming in laterally through the wall, injection is probably no good for you. This is good advice if you are thinking of tackling the problem yourself D.I.Y. but it's even better advice if you are thinking of paying a contractor. If they are just going through the motions of selling the traditional damp injection and render without taking note of the type of damp or the method of ingress we advise that you get another firm in to quote. To find out more please see http://www.conifer-property-services.co.uk/damp_proofing we will be happy to offer advice if you are unsure. When tackling the same problem with a membrane solution we usually go higher than the recommended metre in height. We normally dig the membrane into the concrete a few inches too, and go up to the full height of the membrane if running longways across a wall. This is very effective against rising damp or penetrating damp. Also, if you only get to the height of 1m with your membrane, you may sometimes find you get a salt line all the way across your wall in time. So it pays to go over if you can. 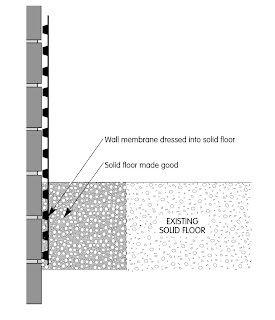 The diagram opposite shows a typical installation of a membrane to combat rising or penetrating damp, in extreme cases or if you are unsure please seek professional advice. Happy damp proofing everyone! We'll be back with more tips and anecdotes soon!